When choosing guest bloggers for my Cre8tion Crochet I primarily work with blogs that I either really love or with bloggers who are open to sharing and helping each other. Rhelena of Crochet Pattern Bonanza fits into both categories. Crochet Pattern Bonanza is a pattern directory run by Rhelena that offers free crochet patterns. Crochet Pattern Bonanza is the sister site to CrochetN’Crafts which is where Rhelena primarily shares her own patterns, as well as patterns from other crochet designers. I “met” Rhelena when she approached me about putting some of my patterns on Crochet Pattern Bonanza. We have since formed a great friendship. I truly believe in reciprocity and so does Rhelena. We have both tried to help each other along the way. Rhelena is also a fantastic crochet designer. I love her patterns. 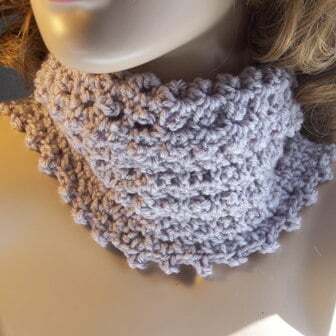 This pattern is offered exclusively to fans of Cre8tion Crochet. This gorgeous Picot Arm Warmer and Picot Cowl are definitely going on my list of things to crochet. 1- How long have you been crocheting? I was taught the basics of crocheting when I was about 9 or 10 and crocheted on and off throughout my childhood and teenage years. It wasn’t until my early 20’s that I got serious about it and taught myself to read patterns. In 2006 I started playing around with my own designs and started publishing them online in 2008. 2- How long have you been blogging? I started my first website in late 2008 after I lost my job due to health reasons. 3- What are your favorite items to make? When I first got serious about crocheting I enjoyed making thread doilies. I made them for all my coffee tables and dressers. Now I enjoy anything that allows my mind to be free, such as blankets, bags, hats and scarves. I also enjoy making tops for myself and hope to get into designing more of those in the near future. 4- What is your favorite thing about crocheting and or blogging? My favorite thing about crocheting is that it helps me to relax while giving me a sense of accomplishment. As for having a website, it gives me the hope of earning a living one day by doing what I enjoy most. 5- What are your favorite yarns (brands or types) to work with? It depends on how I look at it in terms of price and what I enjoy working with most. But I tend to favor Patons Canadiana – The New Generation and Aunt Lydia’s Size 3 Crochet Thread because they are reasonably priced and result in beautiful fabrics. 6- What was your inspiration for your pattern? A lot of my inspirations come from what I actually need for myself, or from requests. It forces me to brainstorm and often one project idea will lead to another. I keep a list of things I need/want to make for myself, and I usually take it from there as time and inspiration allows. Also, a lot of my inspiration comes from other designs. That’s one of the beauties of owning a crochet pattern directory as it allows me to see many inspirational designs. 7- Tell me a little something about your personal life… kids, family, pets, etc. Currently I live by myself in a small apartment. I’m trying to overcome a life-long illness with natural remedies and cleansing. So naturally, solitude is one of the best friends I could ask for at this time. Also, I love to do yoga and meditation. 8- Tell us a little bit about Crochet Pattern Bonanza and CrochetN’Crafts. When were they created. CrochetN’Crafts was created in late 2008. That’s where I have published the majority of my free patterns. All patterns are free at the time, but I hope to design some for sale in the future so as not to put all your eggs in one basket. As for Crochet Pattern Bonanza, a free crochet pattern directory, it was started in 2011. 9- What type of patterns are you looking for. I’m looking for all types of crochet patterns as long as they are free and the designer/publisher is allowing me to use the image in a thumbnail link. 11- How do fellow bloggers get their patterns featured on your sites? To get listed on the directory, simply send me an email or fill out the submission form on my directory. You’ll find my contact information under the “contact” and “submit link” tabs at the top of the page. You can write up a short summary of yourself or website and I’ll put you in the “featured designers” spot for a day. I hope you enjoyed getting to know Rhelena as much as I have. If you are a crocheter you will want to visit Crochet Pattern Bonanza for lots of free patterns. 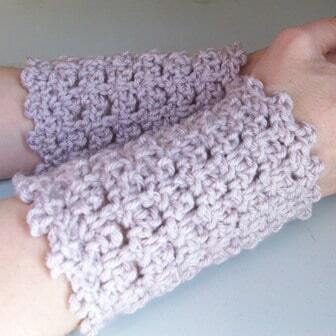 Be sure to take a peek at CrochetN’Crafts which features more of Rhelena’s original designs.